A case of 'I do not come to you by chance', perhaps! Dear Anonymous... the joke is on you...idiot. did anyone notice the website address: en.wikipedia.org/royal_dutch_shell?! 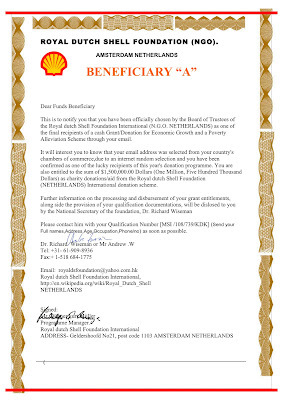 An interesting certificate from a foundation that does not exist, where Dutch in the name is not capitalised, Mr Andrew has no surname, you can call the Netherlands, but fax the US and email Hong Kong. As for the address at the end, it exists but never in that format. Phew! What planet do they live on? Nah, I don't think you will like any of those. I guess the best idea would be to return the money to the givers. They can use it for themselves.